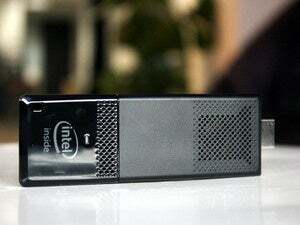 Intel’s new thumb-size Compute Stick PCs are getting faster and more sophisticated, but also more expensive. Two new Compute Sticks—which plug into TVs or monitors—will be “in production” next month with the latest, sixth-generation Core M3 and M5 processors. Those processors are also in some of the latest laptops and hybrids shown at this week’s CES. A Compute Stick with the Core M3-6Y30 will be priced at $399 with Windows 10. A Core M5-6Y57 vPro Compute Stick model will be priced at $499 without an OS. The devices will have 802.11ac Wi-Fi, 64GB of storage, 4GB of RAM and three USB ports. 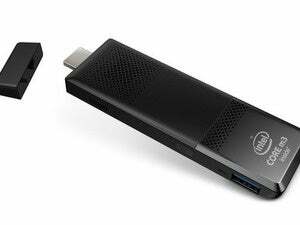 Intel also announced a low-cost Compute Stick for $159. It will have the Atom x5-Z8300 chip, 32GB of storage, 2GB of RAM, 802.11ac Wi-Fi, two USB ports, and Windows 10. Intel didn’t provide exact shipping dates for the Compute Sticks, but the products could become available in, or soon after, February. The high price of the Compute Sticks with Core M chips is unprecedented, especially considering the devices were introduced as low-cost computers that could easily turn any display with an HDMI port into a computer. The new processors may have factored into the higher price. Intel is clearly targeting the Compute Stick Core M5 vPro model at the business audience, where data access, user authentication and remote device management really matter. The vPro chip has features that allow system administrators to remotely control usage of the Compute Stick. Intel last year announced the Compute Sticks with the Core M processors, but didn’t announce pricing or availability.